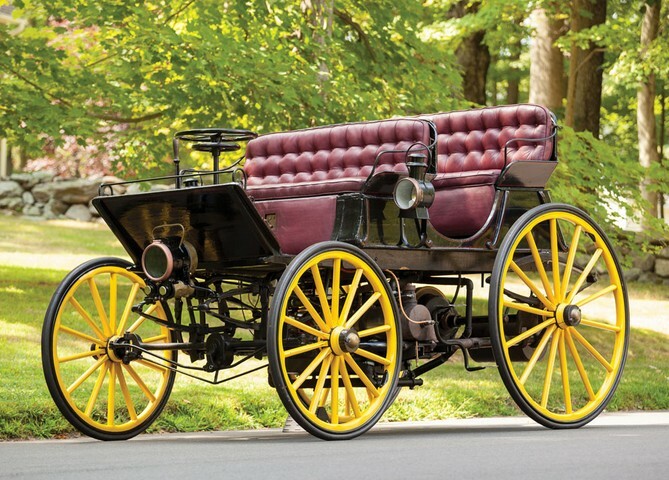 This is one of the oldest cars we’ve ever featured and it’s apparently the only car ever built by the Armstrong Manufacturing Company of Bridgeport, Connecticut. This car was completed in 1896 but was likely built between 1894 and 1895. It’s huge – a literal horseless carriage. And frankly, it’s kind of scary looking. But I love it. The engine is a 6.0-liter twin and the car features a number of ingenious features that wouldn’t be found on cars for at least another 20 years – such as a silent, electromagnetic starter. It’s fascinating. It competed in a race shortly after completion and was placed on sale in New York City after the race. It didn’t sell, and Armstrong took it back to Connecticut. Armstrong built products until 1950 when it was purchased by Capewell Manufacturing. The car was moved and in 1963 found its way into a Capewell employee’s garage. In 1995, it was discovered by the outside public and has had a few owners since. It’s a remarkable automobile that has been sorted and works. It should bring between $550,000-$700,000 and it’s worth every penny of that. Click here for more info and here for more from RM in Hershey. Update: Not sold, high bid of $375,000. Update II: Sold, Bonhams Amelia Island 2016, $483,400. This entry was posted in Uncategorized and tagged 1896, armstrong, auctions, cars, classic cars, phaeton, rm auctions by classiccarweekly. Bookmark the permalink.